Currency Denotification- What Will Happen To Economy? There are lot many ‘may’ doing rounds in media, rarely is anyone certain about how the Indian economy will respond to government’s move of stripping INR 500 and 1000 notes of their legal tender status. This is why we do not have ‘will’ in any opinions and forecasts. Consumption ‘may’ be hit, GDP growth ‘may’ plunge, inflation ‘may’ ease and unorganized sector ‘may’ be the casualty, are a few estimates by financial and political pundits. Another glance takes us to gold ‘may’ lose its sheen, real estate ‘may’ plummet further and the likes. Nobody’s convinced of his own theory and conclusion; no one is daring to say that the economy ‘will’ see variations in a particular way. Agreed, it is not the cup of tea of self-styled economists and of politicians unacquainted with even basic economic concepts like demand-supply correlation to predict the exact footprint this denotification of currency notes move will leave on the economic landscape of our country, on various sectors of economy, on job creation, consumption and inflation. Then should we stop venturing into the field of how the economy would respond to the present drive of unearthing black money and resultant cash crunch, or isn’t it a better idea to be a bit pragmatic while analyzing. Here, we shall go with the second option. You can if you want to, but then the risk will be all yours. And with the multiplicity of news channels and plethora of experts assessing the impact, you may boil down to gaining nothing, albeit losing even your own astuteness to judge events like this. Moreover, these experts aren’t real economists, they are politically inclined either to left, right or center; they will paint the picture as it suits their respective political ideologies. In the news, the length of queues outside banks and ATMs can be correctly pictured, but all else, even the emotion of general public are played with, distorted. 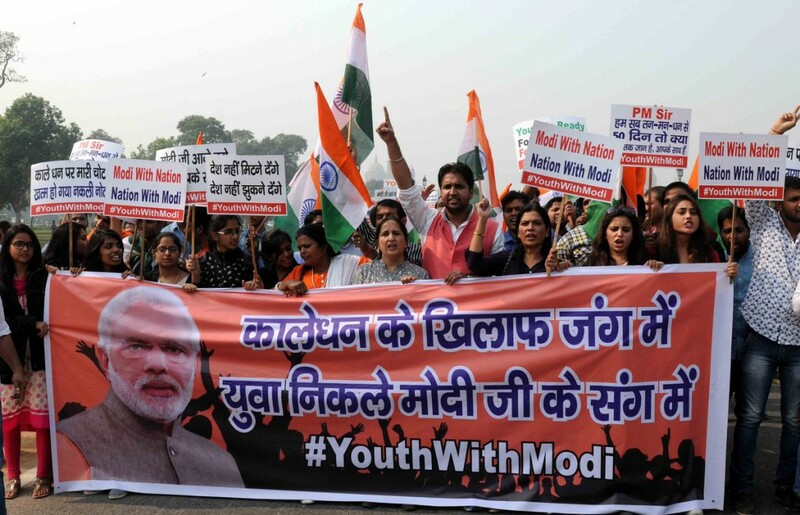 You can end up watching totally frustrated public on one news channel, while on the other you will find people chanting the PM’s name with heightened vigor and ever-high dedication. In some reports, people would be seen overwhelmingly backing Modi government’s decision; on the other, distressed men and women are ready to recall their Prime Minister, had they been empowered as such under the law. Is there a way out, a rational view? Rarely can anyone be so smart and precisely practical to forecast GDP growth rate, job creation, inflation figures and bank rates after unexpected events like the one that saw Donald Trump winning the presidential race in the US or the UK voting out of European Union. The dust only settles when all facets of economy adjust to the event, and this adjustment can only be a matter of guesses and estimates, not codified judgments. But when such events and adjustments have a bearing on the lives of all citizens of a country, it becomes imperative to prepare oneself for upcoming changes; forecasting, extrapolating and speculating then become a need, not just an exercise in vain. Hereunder we shall discuss the impact of currency denotification on sectors of Indian economy in a way that is pragmatic and real, not illusionary. Banks have been reeling under capital deficit that has impacted credit growth. The central government made budgetary provisions to infuse capital in banks; this however is a long-term scenario. On the contrary, banks have seen windfall of deposits in the post-November 8 scene, even Jan Dhan accounts, infamous for being a zero-deposit liability, have received more than INR 50 thousand crores as credit. With banks’ accounts improved and lending capacity increased, economy can expect revival in loaning activity, from businesses to small farmers, beneficiaries will be all. Also in the offing are reduced lending rates and loans for those who couldn’t get institutional credit owing to lack of banking transactional histories as they now have active bank accounts. Banks, however, will have to be vigilant in their credit extending activity since uncalculated risk will only intensify their NPA woes further. Also, co-operative banks will need to add transparency in their operations; scheduled banks must reach rural and untapped markets. In the short-run, this can be an area of pain for the government and society as a whole. Last couple of years, when GDP growth rates were the best in the world, job growth did not match even modest expectations. And in the period after bank notes recall, when economic activity and consumption has taken a hard hit, this segment will only contribute to additional agony. In the long-term however and when economy adjusts to new currency and rekindled spending, hope does exist. The government will tax deposits that do not match with legal source of income, and the RBI will also decrease its liability to the extent old currency notes do not reach bank vaults, thus dividend to government will be hiked. All this will enhance the capability of government to allocate more funds to infrastructure spending (if they choose this over the populist subsidy regime), which can become the major sector to generate jobs, thus add to consumption and spending, and thereafter begin the cycle of further job creation, then spending, then more job creation and so on. There is a widespread fear of dip in property prices, which is backed by solid reasons like the rigged property market where purchases have substantial cash involved, and slow economic growth. To an extent, this picture looks real, but add to it the passing of Real Estate Regulatory Act, cuts in key repo rate by RBI since the beginning of 2015, schemes like Housing for All and there comes a ray of hope. The currency recall move strikes the right chord. With an increase in assets of banks over liability, interests on term deposits is anticipated to reduce, which in turn will pave way for home loans at more attractive rates. Even in a scenario where we consider prices at same levels, property will become a preferred investment option for buyers as they will now not seek paltry interest on deposits offered by banks. Rather, investing in property will enable buyers own an asset, besides earning better returns by renting the property and availing tax benefits on repayment of home loans. The point to notice about yellow metal market in India is that gold is a safe haven for many investors, including the retail investor who doesn’t go for stock market, rather keeps gold as asset. While cash is the new unfavorable stock in post-demonetization period, people would park their money in other places, preferably gold. The yellow metal market of India is to see its golden period in the near future and in long run. This also reflects in record high import of gold after November 8. For sectors ranging from hospitality to automobiles and metals to consumer durables, the November 8 announcement has brought negative repercussions. There is not a single industry that did not see a slowdown in sales in the backdrop of cash shortage in the market. Does that turn into a bigger chaos in the long-run? It is to be noticed that cash in hand was not the lone stimulator of consumption. Agreed, lessened liquidity has invited slump, this is only for the duration when newer currency isn’t made adequately available and it won’t be a month or two from today’s date that normalcy will return. What will then decide growth in retail and other sectors will be credit growth, job creation, public and private investment and most importantly, transparency in functioning of economy and financial markets. Digitization of transactions will not only expedite exchange of money, it will also produce a trail of all transactions, thus a balance sheet of the entire economy. Debit card payments and e-wallets are witnessing their best-ever period, and the government will have to work further for a smooth transition from cash based economy (more than 98 percent transactions are in cash today) to a cashless, transparent and swiftly transacting economy. Panelists on news channels will predict a future of their liking; they may not come with statutory warning, paying heed to such verdicts, however, will be a loss to the astuteness of common man. You know that with reduction in the level of parallel economy of India, inclusive and sustainable growth will be the outcomes. It can be accepted that the GDP growth rate may take a hit in the short-run, but that doesn’t mean that Indians are losing. Even with world’s best growth figures, we have faced agrarian crisis, high unemployment, disparity in income distribution, malnutrition among children. Thus a lesser than expected GDP growth figure will be no conclusive evidence of Indian economy moving into the red. Long-term forecast does appear promising; the government and key functionaries in the economy, ranging from banks to public sector undertakings and privately held enterprises to autonomous institutions, will have to play their respective roles attentively and prudently. Government has been tweaking guidelines for currency exchange and deposit/ withdrawal every passing day, and this can be indicative of its receptive approach than its unpreparedness (a call this hard had come unanticipated, thus unready). And so, the opposition that is unitedly creating ruckus in Parliament – alleging that the step has hit the country and its economy hard– must read between the lines and acknowledge that currency recall can be an enduring win. The November 8 announcement can be the most productive step of the present government. The unintended beneficiaries post-announcement were state electricity boards where people thronged to clear dues; if one looks at such patterns, future seems to hold the key to a better India. Benefits and demerits of demonetization can wait… What is required now is to create a robust model around the situation created. If only every Indian pledges not to pay bribes and not evade taxes after your CA uses all permutations and combinations and finally decides how much tax to pay. We will all pray for a LOKPAL type bill, to check our bureaucrats who have made it their birthright to ask for bribes to their work for which they are paid salary. Black money is two fold.. 1) Evaded taxes. (2) Bribes taken. Evaded taxes is taken care by this demonetization … But BRIBERY who’s going to bell the cat. Our honorable PM needs non-corrupt ministers too. Does he have an army of non-corrupt people around him to take India to the RAM RAJYA everyone is looking for ?????? Poor planning…. i assume new Rs 500 notes are been printed only after the announcement of ban under old Rs 1000 & 500 notes. Still not all ATM machines are functional. People have to plan to wait to take their own money from bank for at least 2 hours in min. Nobody is against the good goal behind this announcement but ultimately poor planning on any field or any action could have a big impact on outcome. 2. BJP continues to take huge cash donations. BJP is the recipient for the highest donations and also the biggest spender in election campaigns. Is this money legal ? What are the sources of these donations as for 80% of the donations BJP does not reveal source. 3. BJP has diluted the anti-graft law to protect and shield government officers and not even CBI cannot touch them without prior approval. 4. BJP is not taking sincere actions on cases related to tax and other irregularities where adani or ambani are involved. 5. There are at least two videos of BJP leaders which establish the information about demonetisation was selectively leaked. 6. It has come to light that BJP made huge land purchases before demonetisation. 7. 31% of BJP MP’s have criminal cases against them, modi although promised to take these issues head on and will not hesitate to jail even BJP MP’s has done nothing so far. 8. BJP is vigorously trying to handicap judiciary , not appointing judges and indulging in constant confrontation with the judiciary, this they are doing so that BJP can have influence on judiciary and can also indirectly control it. 9. Although modi ferociously attacked congress for corruption , he has so far dont nothing to prove that corruption neither has any congress gone to jail. They released a complete a book about Rober Vadra corruption ,still there is no action. This despite BJP having full majority. If they can send AAP Mlas to jail so easily that too on false charges whats stopping them to act on congress whom they have accused of enormous corruption? 10. Modi accused NCP of being naturally corrupt party. BJP accused them for 75K crore irrigation scam. Now instead of talking action against the naturally corrupt party and investigating the scams modi is cozying up with pawar and singing eulogies in his praise. Our Prime Minister has taken enough steps for Cryptocurrency, things can’t be changed over night , that too all these are STRONG 60 year old. Catching of 10% of people, for me, is just incidental. The move will usher in a more healthy habit of spending in white and of being more responsible citizens. Only the uninitiated or the naive section of the society can view this move as a pain. Corrective measures are painful and the duration of the corrective action showing results is long drawn. For sixty long years, the nation has been a repository for financially irresponsible populace. Change is certainly desisted by such die-hards. I do not agree completely with the views expressed by Dr. Sunil Gupta. However, we will have to wait for little longer to see the pros and cons of this demonetization. If tea maker made PM who should know atleast need of currency like rs. 500, 1000, 100, 50, 20, 10 in business, then consequence has to affect people. These currencies has no alternatives. Enough notes of Rs. 500, 1000 should have been researved similar to the no. notes cancelled. What pandits in the govt. are doing? China has praised and Mudis survey shown what will happen. The no.s of notes cancelled if can not be printed then imagine. Govt. should have known its note printing capacity. Politics should also be cleansed in the same way by freeing the country of corrupt politicians. Once this is achieved everything else will fall in line. There is one thing not being talked about by anyone. Paytm has a chinese backing. Alibaba is the largest shareholder in this company. Why is SBI e wallet not being promoted and used by Indians? Unacceptable that people had to stand in queues for getting their own money. This is constitutionally wrong and Modi should accept this failure. I can see almost all businessmen, big or small, in favour of decision of central government. This is not a trend in India where people are mostly divided. May be this is because of renewed patriotism. Media will only talk negative because they know that their privileges will end after Modi is successful in changing India. Do not watch news instead. Hello there. I could have sworn I have been to your blog before but after browsing through a few of the posts I realized u are an amazing writer for sure. Regardless, I am certainly happy I tumbled upon it and I will be book-marking it and checking back regularly. What I can say is that no one can predict what is going to happen in future. Economy will either gain or lose is a combination of many factors not just demonetisation. Country awaits many other reforms which were promised in 2014 by BJP. I congratulate dr.sunil gupta for such an amazing blog on demonitisation covering all aspects.it is a bold step taken by our PM MODIJI,to root out high corruption and black money and move towards less cash economy. I personally appreciate this move from our PM. A neat, simply written, focused on fundamentals article. Yes, lets be positive and let the future unfold. It is called a bold initiative. Any bold step has either difficult execution and/or uncertain outcome as necessary element/s. I respect our chosen leader and have no doubt on the intent. They have been proactive and cautious, which is appreciated. Yes, people have suffered inconvenience and stress. Our preconceived notions and biases make us see glass half full or glass half empty. Same applies here, too. This is only one key step and the full impact will be culmination of few collaborated actions. I am with it and optimistic. thanks for the nice article. Will the prime minister target gold and real estate holdings of people is a questions that is disturbing peace of blackmoney holders. Let us wait and watch. Commerce has already declined to such level that no near growth can be expected. People are being inconvenienced by government and this nothing but sheer dictatorship. Prime Minister of our country is leading in the race be the person of the year in Times poll. This is the first time that we have such strong PM and we should be proud of this. It is well said that Indian economy will benefit in the long run after ban of 500 and 1000 notes. When corruption and black money will be eradicated, a new India will be born.